World War II is the deadliest conflict in human history, with tens of millions of deaths, most of whom were civilians in the Soviet Union and China. Besides these fatalities and casualties, the war destroyed infrastructure, included genocide and massacres, caused starvation and disease, and introduced nuclear weapons to warfare. In Europe, the Allies fought the Axis on the ground on two fronts, as well as an air war above the Mediterranean and Middle East. In the Pacific, the Allies fought the Empire of Japan. For this feature, we’ve selected various maps in the European theatre. 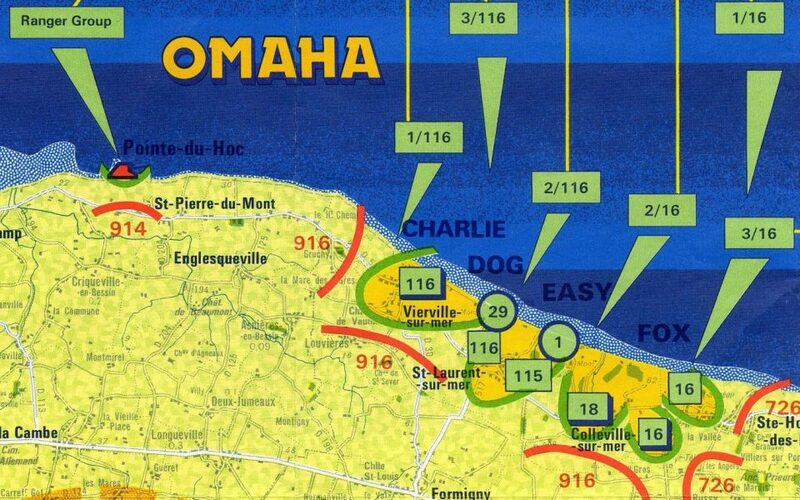 On the Western Front, we have many maps of France, which was defeated by Nazi Germany in 1940 and resulted in the occupation of northern France. Depicted are the movements of armies from Allied countries across western Europe, aiming for liberation of occupied territories and victory over the Axis powers. Air warfare was a core element of the war, utilizing strategic bombing to disrupt industry and politics instead of aiming only for military targets. In our collection, we have a map of Berlin showing the effects of air raids, marking buildings that remained intact and those that were damaged in the bombings. In the Pacific theatre, Japan implemented strategic bombing as well, mostly targeting civilian populations. The United States officially entered the Pacific War after the attack on Pearl Harbor. The U.S. published a collection of posters and news maps that provided information on the status of the war and on the enemy. They were distributed to the U.S. military and war production facilities, and production lasted from 1942 to the end of the war. Post created by Dawn Collings and Jeanelle Wan.